An artist dreams of turning social insects into police intelligent units — to help track illegal plants growing around town. Robert Krulwich is on the case. It is important to put budget issues in perspective, so I have a simple request that President Obama, the top members of his administration, and his allies in Congress send a hand written version of this letter to constituents: Dear low-income American, I know times are tough. According to his spokesman, Reid requested the meeting with Obama — after Obama openly courted House and Senate Republicans at the White House last week. They apparently discussed the House’s proposed cuts, “and what they mean to real people in their everyday lives,” according to Reid’s office — notable because many of the cuts overlap with Obama’s own budget recommendations, though the GOP’s dig deeper. “Sen. Reid also reiterated his position on protecting Social Security,” the statement concludes. The rest of them, all of them, got off. Not a single executive who ran the companies that cooked up and cashed in on the phony financial boom — an industrywide scam that involved the mass sale of mismarked, fraudulent mortgage-backed securities — has ever been convicted. Because Wall Street owns the government. Lock, stock and over the barrel with all 3 branches of corporatism. Somehow, we are supposed to believe that the English speaking peoples have a corner on democracy. The rest of the world is still learning. When the oppressed of a nation, particularly of the third world, stage an uprising, it is neatly packaged and color coded. That way it's easier to follow. The Western leaders and press assume an avuncular pose and pass judgment on how the various colors pass along the path to self-determination -- not too fast, not to0 rowdy, and certainly not to0 disruptive to first world markets, especially oil. This is the final post of the four part series by Felice Gelman who writes about her recent trip to Gaza under the pen name rosahill. Here are links to the first three posts from her diary. Here are links to the first three posts, Part I, Part II, Part III. Our meeting with the Palestinian Center for Human Rights is the best orientation to the impact of the Israeli attack. PCHR meticulously documents everything, and deals quite fearlessly with both internal and external violations of human rights. PCHR estimates that, during the Israeli attacks, 2,500 tons of explosives were dropped on Gaza. That equals 3 kilos of explosives per meter. (They have a massive display of weapons fragments in their office, with all too many bearing indications that they were made in the USA). Last week, at a meeting of his country's ruling party, Egyptian President Hosni Mubarak accused Iran of "trying to devour the Arab states." Don't worry, Hosni. Iran won't eat you. It can't. It can't sit on you either. It's too far away. 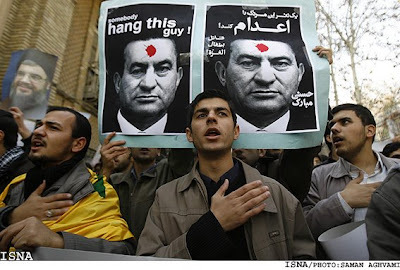 What led Mubarak to say such a mean thing about Iran? Well, it seems that a bunch of Iranian students shouted a bunch of mean things at the Egyptian embassy in Tehran, including their apparently genuine wish that someone would hang Mubarak. The Iranian students shouted mean things about Mubarak because Egypt wouldn't let the Iranian Red Crescent sneak around Israel's blockade of the Gaza strip and deliver food and supplies to Palestinians, who have been reduced to eating grass. So Iran wasn't trying to eat Arabs; it was trying to feed them. Gee, how did Mubarak get that story all backwards? Abu Nidal on U.S. Payroll? If Robert Fisk's reporting, and the files they are holding, are believable, apparently we had another of those Evil Terrorists People on our payroll, working and spying for us. It wouldn't surprise me. Things never seem to change especially when the names and faces of long time inner Washington keep popping up! I caught this Report: Notorious Palestinian Mercenary Was Hired by U.S. to Find Link Between Saddam and Al-Qaeda over at Alternet. But it can also be found at the original report in the Independant who have the files mentioned in Fisks writing. Iraqi papers obtained by The Independent state that Abu Nidal was "colluding" with the U.S. Many knew of, and tried to stop, the 'collusion' of the U.S. with Saddam, supplying him his wants of 'chemical' and 'biological' weapons, WMD's, in his war against Iran who were using this type of warfare arsenal. Read more about Abu Nidal on U.S. Payroll?